The hammered dulcimer is a musical instrument consisting of a trapezoid wooden box with strings stretched over bridges sitting atop the soundboard. It's played by hitting the strings with small wooden hammers. The sound is enchanting, and seems to be the main reason folks learn to play. There's some debate about the hammered dulcimer's background, but it's believed by many to have originated in ancient Persia some 2,000 years ago. Variations can be found all over the world, but the instrument as we know it in America developed primarly in the British Isles. The hammered dulcimer is a very accessible instrument, which is to say that it's fairly easy for the beginner to get a good tone. And because it's constructed around major scales, it's pretty easy to find simple tunes. In fact, most folks learn by following patterns, even if they can read music. Of course, playing well takes dedication and practice, but the rewards are well worth it. The only drawback is that hammered dulcimers are a little hard to find, because they're not "mainstream" instruments made in the tens of thousands. On the plus side, nearly all hammered dulcimers are hand-crafted by skilled artisans, so you're likely to get a quality instrument no matter who you buy from or what model you buy. Prices start around $250 for a small student model and go as high as $3,000 for larger, more complex models. Hammered dulcimers are strung side to side, with the strings crossing over the treble bridge (to the left) or the bass bridge (to the right). Notes are played by hitting the strings near the bridges with small wooden hammers. Most dulcimers have at least two strings for each note, mainly for volume, and each string pair is called a "course." If you've ever looked inside a piano, you probably noticed that the hammered dulcimer works on the same principle, which is wooden hammers hitting tuned strings. This is natural, since the hammered dulcimer is one of the piano's ancestors. The obvious difference is that the piano has a separate, fixed hammer for each course, while the hammered dulcimer has only two hammers, which the player moves to hit different strings. This scale is played bottom-to-top, first on the right side and then on the left, following the numbers in the diagram. Dulcimers come in a variety of sizes, classified by the number of courses on the treble and bass bridges, respectively, as 12/11, 15/14, etc. The 12/11 is the basic size, with a range of 2-1/2 octaves, starting from G below Middle C. The 15/14 is probably the most common size, adding a half-octave to the lower end of the 12/11, down to D below Middle C, for a full three octaves. There are many variations on this theme, some smaller, most larger, and many with some sharps and flats not found on a standard diatonic dulcimer. The modern renaissance for hammered dulcimers started around the early 1970s, and has really flourished with the recent resurgence of traditional music. It's now making inroads into mainstream music, showing up in movie and TV soundtracks (even an episode of Pinky and the Brain!) and all forms of popular music. If you'd like to learn to play hammered dulcimer or just discuss the possibility, see Learn to Play Hammered Dulcimer, or contact me. If you know how to play and just want to jam, I'd like to hear from you, too. If you'd like to learn more about the hammered dulcimer, including where you can buy one, click here to go to my Links page, and look under (what else?) Hammered Dulcimer Sites. 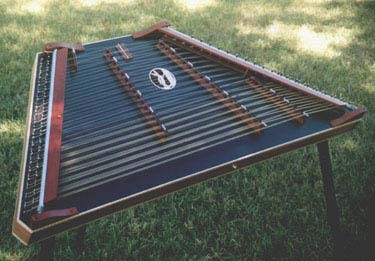 The dulcimer pictured at the top of this page (my main instrument) was designed and built by James Jones of Bedford, VA. It's a 3/16/18/9 Custom Performance with a redwood soundboard (finished in black), paduak bridges and dampers, mahogany frame, and curly maple trim. I am extremely happy with this instrument and would be glad to answer questions about it. © 1997 by Christopher W. Peterson.